If you're looking for a Clone Trooper costume that says authenticity right down to the last detail, look no further - because you've found it! This Clone Trooper costume is made of 100% polyester, and it is almost completely covered with white EVA rubber armor pieces. The lightweight armor sections are sewn on, and they include shoulder armor flaps, chest armor, and shin guards, as well as armor for the pelvic region, arms, and upper thigh. 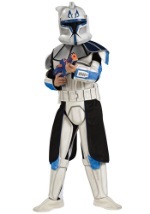 The armor is painted blue and white to resemble the loyal soldiers of the Republic in the hit movies. Jumpsuit has a Velcro closure at back of neck. The white attached foam shoe covers fit around bottom is shoe with an adjustable elastic band. The 2 knee armor pieces attach over the jumpsuit with Velcro. The white vinyl utility belt has raised sections of different shapes to resemble all the compartments need to hold the survival equipment of a Clone Trooper. The belt attaches around waist with Velcro. (Belt fits waist sizes up to 48".) The sturdy white PVC helmet has 2 pieces - one to cover the front of head and one to cover the back. The pieces fit together with Velcro attachments. (With both pieces, helmet fully covers head.) Like the jumpsuit, the helmet has painted-on authentic details, like gray and black buttons at bottom and sides to denote the special communication and visual imaging capabilities of a Clone Trooper helmet. The upside-down "V" shaped mouth opening has holes to allow better ventilation. You see through the mask's clear front T-shaped visor. 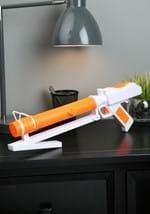 Top off your costume with a Trooper Dart Blaster!